Links Page - Links to other sites and pages of interest. The Very Scary Productions Links Page provides links to other websites including independent filmmaker sites, actor sites, horror film sites, movie review sites, blogs and more. There are also Very Scary Productions banners at the bottom of the page for those who would like to link to this site. * Disclaimer: Be advised that some sites may not be suitable for some people. I don't have control over, and am not responsible for, the content of sites linked on this page. The website of Upstate New York-based independent filmmaker Michael Kazlo II, director of the feature films BLOODLUST, CRYPTID and DR. ACID FACE, as well as several short films. The IMDb Page of filmmaker and effects artist Brett Piper, director of QUEEN CRAB, SHOCK-O-RAMA, BITE ME! and many others. The Facebook Fan Page of B-horror and Independent Film Actress Danielle Donahue, star of such movies as SURVIVAL KNIFE, JURASSIC PREY, and BIGFOOT VS. ZOMBIES. (You must login to FB first for the Fan Page). The Facebook Fan page of indie movie actress, scream queen and sculptor Deana Demko, star of my short horror movie THE HUNT. (You must login to FB first). 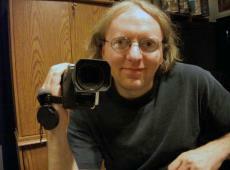 The website of Peter Hanson, director of the documentary EVERY PIXEL TELLS A STORY and writer of many books about film. Joe Bagnardi, director of such movies as PROJECT D: CLASSIFIED, SHADOW TRACKER: VAMPIRE HUNTER and THE EDGE OF REALITY. Blog site for scribe John Oak Dalton, writer of the feature film JURASSIC PREY, among others. Website for actress / model Mel Heflin. Polonia Brothers Entertainment Facebook Page, YouTube Page and Yahoo Group. Pages dedicated to indie filmmaking pioneers The Polonia Brothers, producers of SOV classics like SPLATTER FARM, FEEDERS and THE HOUSE THAT SCREAMED. The website for David Sterling, producer of over 90 independent movies, including BlOODY MARY 3D, EMPIRE OF THE APES, CAMP BLOOD FIRST SLAUGHTER and more. The Facebook page for musician and B-movie actor Steve Diasparra, star of such films as MUCKMAN, JURASSIC PREY, CAMP BLOOD FIRST SLAUGHTER and more. The website for the city of Albany, New York. I'm including this site here on the links page because Upstate New York's Capital Region is where Very Scary Productions is based. Albany.com has lots of information about the historic city of Albany and the surrounding communities. Check out this site for info on travel guides, hotels, restaurants, entertainment venues and more. Discover Albany New York! Image Quilt Productions is a feature film production company based in Albany, New York. A website devoted to underground arts and artists in Albany, New York. The official website of indie film legend Debbie Rochon. The website of actress Laurene Landon. The website of indie film company Light & Dark Productions. The website of actress, model, and Troma Girl Nikky Irene. The website of actor Peter Austin Noto. TDA Entertainment is a production company owned by writer, producer and director Terri Dawn Arnold. Visit the site for information about her independent film THE TWO SISTERS. www.timritter.com - The website of independent writer and filmmaker Tim Ritter. Wet Shoelaces is an avant-garde experimental music and multimedia project. Ain't It Cool News - A very cool site indeed featuring movie news, reviews and more. All Horror - Discover the best horror movies. Website for New Jersey's Chiller Theatre Toy, Model & Film Expo. The website of Fangoria Magazine - one of the coolest magazines around covering all aspects of the horror genre including films, television, books, DVD and more. A site with indie horror news, reviews & more. Mark Reviews Movies - Film Reviews And Criticism By Mark Dujsik. A cool site featuring movie and entertainment news. theschlockpit.com - Site run by writers Matty Budrewicz & Dave Wain. Check out DTV Junkyard for reviews of "straight-to-disc treats." A Halloween and Horror Directory - scary movies, pictures and sites. The Internet Movie Database (IMDb) is the most extensive movie information site on the web today. The IMDb contains a vast amount of information on just about any movie one can think of, including who made it, who starred in it, and when it was released. This movie resource site from Yahoo! contains lots of information about current and upcoming movies, including previews, reviews, trailers, showtimes and more. Great technology blog by Robert X. Cringely. This blog comes from Stacie Ponder. Her Final Girl blog is about slasher flicks of the 70's and 80's and Final Girls. These are some interesting topics, and also anyone with such an affection for the great sequel A NIGHTMARE ON ELM STREET 3 deserves a spot on the Very Scary Productions Links page. Remember back in the day when the Atari 2600 was the home video game system? Remember the 5200 SuperSystem or the 7800 Pro System? How about the Atari Jaguar? Ever heard of today's homebrew games? If you answered yes to any of these questions (or are curious to find out about these products) head on over to this very cool website dedicated to classic Atari home video game systems. Based in the heart of Scotland, this site sells Gothic Clothing and Accessories, Rock Merchandise, Spooky Dolls, Gothic Decor and more. Skylight Webzine - Skylight is a webzine that has been online since 2000 and specializes in presenting new artists from jazz, progressive rock, alternative rock, hard rock and all kinds of metal. TechNewsWorld is a website dedicated to all things technology. Banner images for anyone who would like to link to Very Scary Productions. (Please save banner(s) on your own server; do not link directly to these graphics) Please link banners to http://www.veryscaryproductions.com/ Thank You. Click here to view the Very Scary Productions banner in a separate browser window. 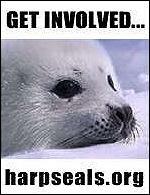 Click this banner to visit Harpseals.org and find out what can be done to help stop the killing of these defenseless animals each year in Canada. Another website to visit is www.humanesociety.org. This is the site of The Humane Society of the United States, an organization working to defend the interests of animals and fight animal cruelty and abuse in all its forms. This site pertains to independent filmmaking and independent, unrated movies (mostly horror). Therefore, not all images and/or videos may be suitable for all people.